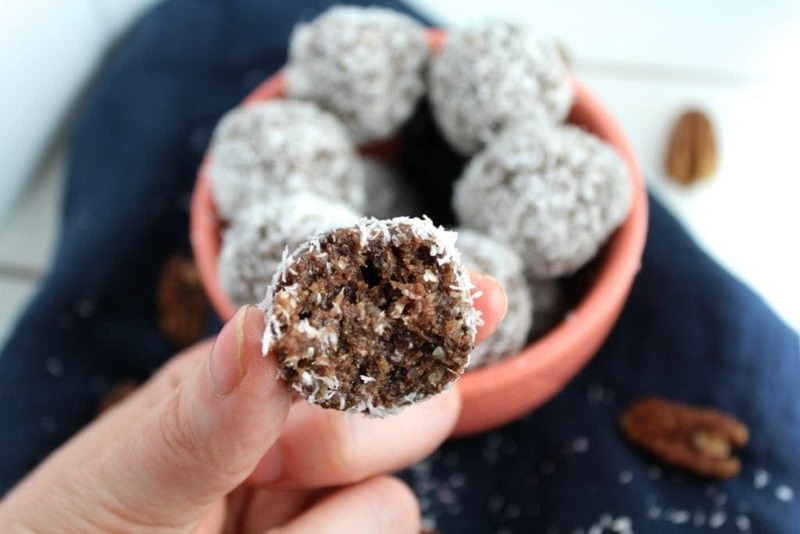 These Whole 30 Chocolate Coconut Bites are an easy, healthy snack recipe! Naturally paleo, packed with nuts + seeds, low in sugar + high in protein! They’re also gluten-free, dairy free, soy free and free of refined sugar! These Whole 30 Chocolate Coconut Bites are seriously one of my favorite snacks to make. They’re quick to make, packed with protein, are made with minimal ingredients and just SO yummy! I started making these healthy bites years ago when searching for an easy snack I could meal prep and take on the go. When you do Whole30, it can get boring and expensive to eat the same things over again in terms of ’emergency foods’. Rather than buying compliant bars, I decided to make my own! Now, before we go ANY further – if you’re doing a Whole30 I want to caution you. These bites are not meant to be used as a treat, or as dessert. If you think these bites may trigger any cravings or your sugar dragon – please wait until you’re done with your Whole30 to make them! If you’re someone who likes to have RX bars on hand for an ’emergency snack’ but you don’t want to pay for pricy bars, this is a great alternative to help you save some $$. RX Bars are an approved ’emergency snack’ on Whole30. Throughout any Whole30 I’ve done, I’ve relied mostly on home cooked real foods, but there were a few times where I needed something in a pinch, and usually turned to RX Bars. The last round I did, we happened to have a lot of dates lying around in the fridge, which are whole30 approved, so I figured it was worth trying to make my own RX Bars to save some $$.. just in a bite form! If you’re not on a whole30, you can enjoy these bites at your leisure. 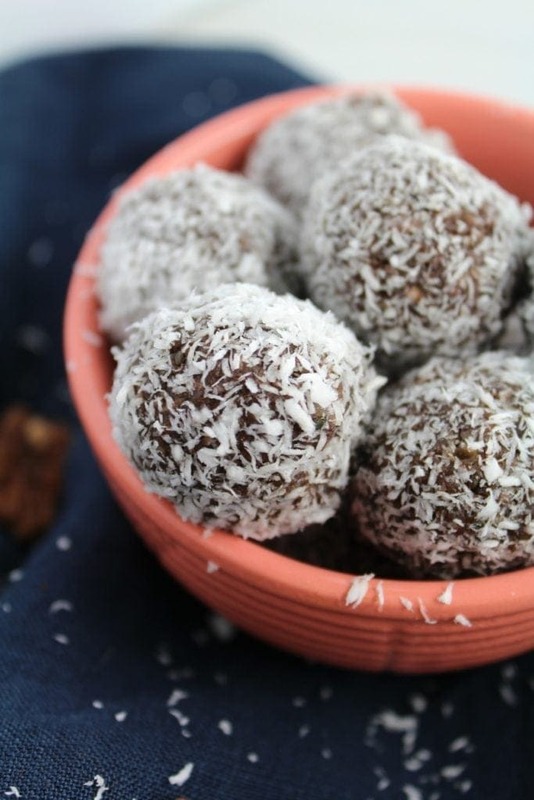 They are a little bit sweet from the dates, but I definitely would classify these as a snack more than dessert (even though the chocolate and coconut combo may make it feel like it’s a dessert!) I like to eat these bites before a workout or when I’m on the go and need something quick! As with all of my snacks, I wanted these to be low in sugar, high in protein. I pulled together some of my favorite NOW Foods protein packed nuts/seeds to build the base, added in a few different things.. and the result was a bite that tasted basically like brownie batter! I recipe tested these a few times to play with the amount of sugar/protein/fat in them, and I feel like this is the perfect ratio. You’re going to love them. Add in hemp seeds. With 10g of protein per serving, these little seeds added extra protein without giving the bites a weird consistency that a protein powder would. Use dates. I honestly had never cooked with dates until a few months ago, but they’re a great natural sweetener + act as the perfect binder in these. Liquid coconut oil works wonders. If your bites have every turned out grainy or dry, it’s probably because they were lacking enough oil. I just used a little bit of this and it made these soft + chewy. Use a softer nut like pecans for the base. I’ve found that almonds/cashews are a little harder which means they don’t blend as well and can give the bites a gritty taste. In addition to tasting great, these were super easy and affordable to make. NOW Foods has a lot of affordable options for raw ingredients that go great in these bites. Many pre-packaged Whole30 snacks can get expensive, so if you’re looking for a simple, quick treat – these are you going to be perfect for you! 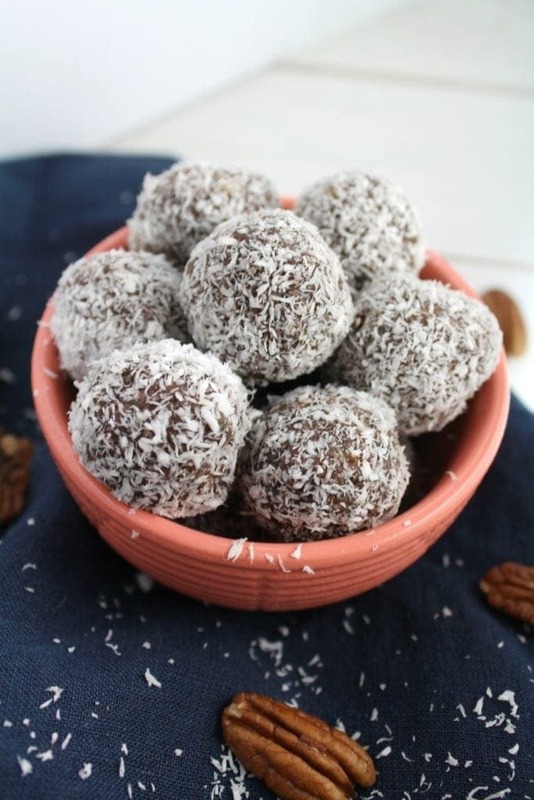 If you’re looking for nut free or non-paleo energy bite recipes, check out No Bake Energy Bites Post. How long do these energy bites last? Looking for other Whole30 Bite Recipes? 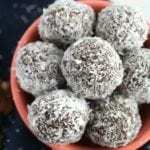 Check out this list of 20 Whole 30 Energy Bites You Have to Try or this list of 30 No Bake Energy Balls. Looking for an easy, healthy snack? 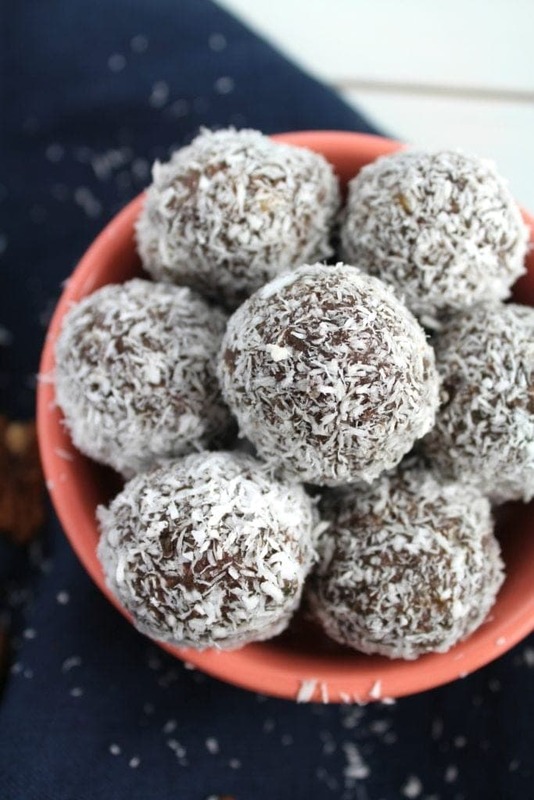 Try this Whole 30 Chocolate Coconut Bites Recipe! Packed with nutritious nuts + seeds, low in sugar + high in protein! They're also gluten-free, dairy free, soy free and free of refined sugar! Add dates to mixture + pulse again. Is there a substitute for collagen peptides? I don’t have them but would like to try this recipe. I’m just not sure what purpose they serve- flavor, texture, glue? Thanks! Made these to have for snacks last week – they were so good I made them again today! Awesome for when you need something quick or if you have a sweet tooth. I’m so glad you liked them, Jackie!! They’re one of my favorite snacks too! The nutrition facts; is it for the whole recipe or each bite? The nutrition facts say that it is for 1 bite. Hope that helps! Holy cow these are amazing!! I’m Day 8 of my first Wholw 30 round and made these for pre workout snacks- so tasty! Thanks!! I’m so glad you like them, Bethany! I like them for pre-workout too because I don’t like a big meal before working out!